The earthquake that hit coastal Ecuador a month ago was felt on a deep level. The initial shock of being on the third floor balcony of our house and watching transfixed as power poles swung back and forth violently like a giant pulling on the attached cables was quickly gotten over. As the true magnitude of the earthquake became known I felt sadness on a visceral level for all the people including friends and families of workers that are suffering the consequences. Like many people throughout Ecuador we quickly moved to make a collection of funds, clothing, canned goods and especially water to take to the families of staff near the city of Manta in nearby Manabí Province. Another blow was felt as the situation was taken advantage of to implement increased taxes, docking wages, etc. in so-called solidarity for the affected communities. With all this in mind, things began to take a rather bleak and dreary appearance. Taking advantage of a stunningly hot and sunny day and a break from the office, I set out to take a walk into the Cerro Blanco Protected Forest. As I walked, I searched out the trees that had been planted in tidy rows along the sides of the trail, the trees still fully leafed out before the oncoming seasonal drought causes them to drop their leaves and go into a period of dormancy. The black clay soils are beginning to crack from the dryness, a few weeks ago this was muddy from the last rain showers. I paused at the overlook with a view of the forest below me. A group of Groove-billed Anis Crotophaga sulcrostris called in some nearby bushes and suddenly, one flew to towards me, landing in a flurry of disheveled feathers almost at my feet and eyed me expectantly. I had no food on me that would attract the bird and have never had anis be so bold before as the bird flew back to the flock that moved on. I continued my walk and less than 10 paces away suddenly saw a flash of white on the ground near some totem poles a artist has installed to invoke the gods and deities of the ancient indigenous inhabitants of this place. A juvenile Gray-backed Hawk Leucopternis occidentalis flew up quickly with something grasped in its talons to a nearby tree. Without binoculars I could not make out what exactly it had but it seemed to be a large ameiva lizard. With a ruffling of its feathers it began to pluck at its prey clenched in its talons. In the same spot a few days earlier I had remarked to a student that it’s been awhile since I have seen any Gray-backed Hawks. These beautiful raptors, gray above and white below are apparently endemic to Ecuador. A friend, Hernan Vargas had done his Master´s thesis on the species focusing on Cerro Blanco and the Buenaventura cloud forest to the south of us now protected as a nature reserve by the Jocotoco Foundation. Gray-backed Hawks as I explained to the student are most commonly seen flying over the wooded ravines loudly calling where they establish territories and nest. Hernan had discovered a hawk nest near the final bridge in the Quebrada Canoa or Canoa Ravine and had set up a blind near the nest and with the help of our park guards, monitored the nest. Hernan decided to climb up to the nest to weigh the single laid egg and unfortunately fell. The bushes along the edge of the ravine padded his fall. A few feet further and he would have hit rock and the consequences much worse. In any case, I was given a scare as we hauled Hernan out to a hospital where X rays confirmed nothing broken, but he suffered some nasty bruises. 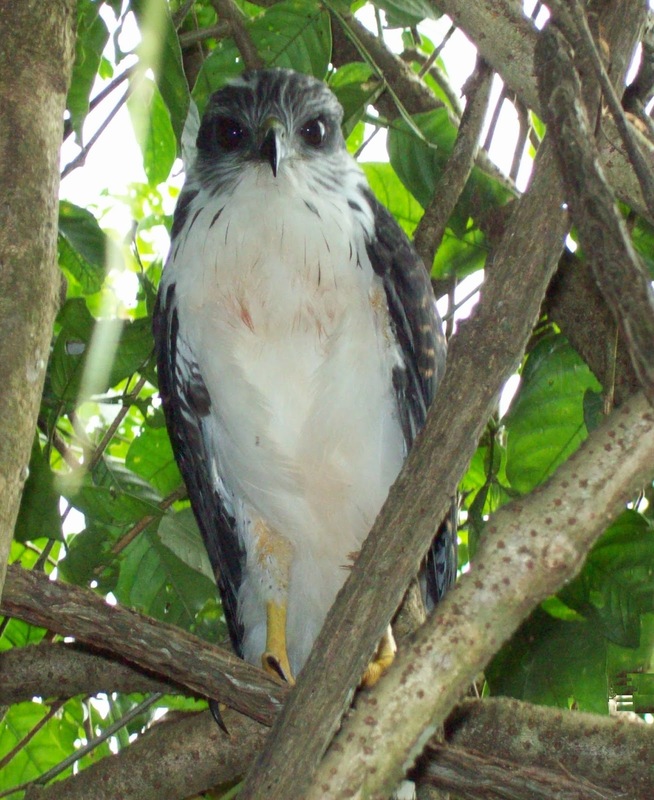 Since Herman’s pioneering study, we have tried repeatedly over the years with different donors to obtain funding for a comprehensive study of the Gray-backed Hawks in the Cordillera Chongon Colonche, but so far no one has shown interest. We offer our park guards a small economic incentive to find hawk nests, which we register with GPS coordinates. The hawk chick featured at the beginning of this blog entry was recorded with a park guard´s cell phone, citizen science in action. Gray-backed Hawks have been labeled ¨chicken hawks¨ and are often killed although my own experience with raising chickens in the forest has shown that Collared Forest Falcons Micrastur semitorquatus avidly hunt chickens. Funding failures aside, the sight of that young hawk, globally listed as an endangered species, gave me hope that despite all the negativities that have been thrown our way recently, Cerro Blanco is here to dazzle and amaze those of us who are awake and watching.